Crucial for any guitar — electric, acoustic, classical, flamenco, etc… — is the position of the bridge. If it is off, the guitar will never play in tune. The traditional way of determining this is to measure down to the 12th fret from the nut, then measure that same distance from the 12th fret. Add 2mm, and that is considered the optimum position for where the strings should contact the bridge. (The 2mm is to account for string stretching as they are pressed down.) There is a little more flexibility on an electric, since most electric bridges are adjustable, but it still needs to be as close as possible to optimum. Once that position is marked, and the holes for the bridge’s mounting posts are measured and marked, the position for the tailpiece can be measured and marked, usually about 2″ from the bridge. (I am using a two piece bridge/tailpiece tunematic style bridge. Others styles combine the two in a single unit.) 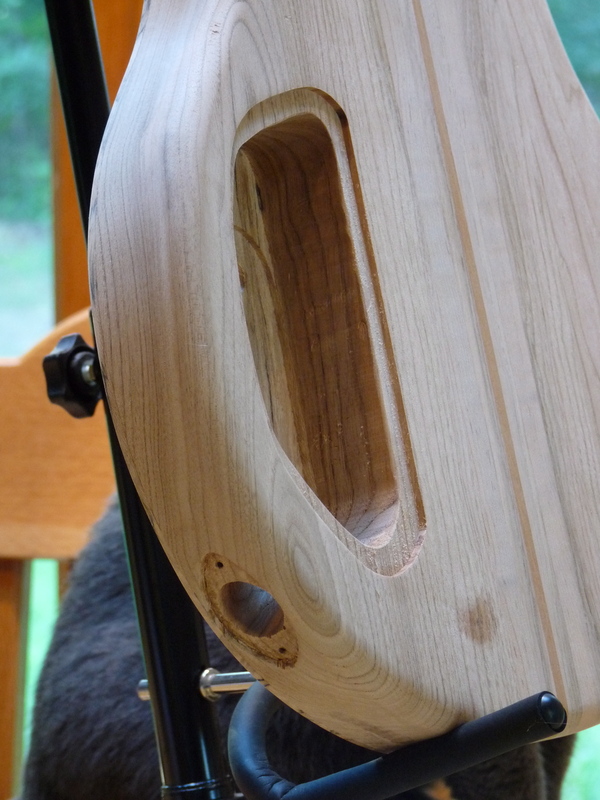 The holes for the mounting posts for both bridge and tailpiece have to be exact and should be a little undersized, so the knurls on the posts will hold tight. The positions for the various volume and tone knobs and pickup selector switch are worked out according to personal preference, and drilled all the way through the body. They will be used as the template for the control cavity. With the holes drilled, I can then position the two pickups. I am using P90 style pickups, common in the 50s and 60s, for a vintage sound. A routing template is easily made using 4 pieces of plywood to go around the pickup cover. The depth of each pickup’s rout is figured by placing a straight edge along the fingerboard to represent the string height, and, using the height of the pickup, calculating how deep to rout. Each pickup will be different, since the string height will change the closer you are to the bridge. Make sure not to take too much on each pass of the router. 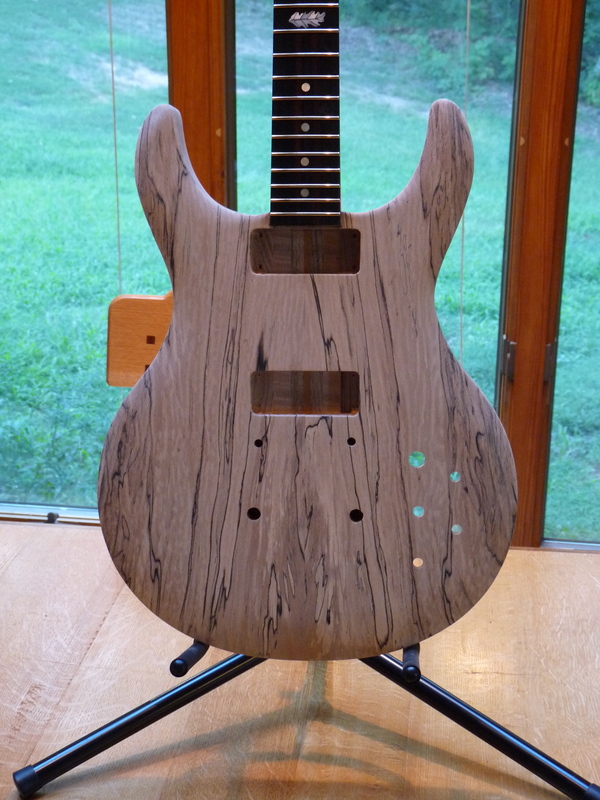 After the pickups are routed, I finished shaping the contour of the top. This is an optional step, but I feel it makes for a more comfortable guitar. Each brand has a typical contour, I ended up with a shape similar to a PRS type guitar, which is odd, since I hadn’t really been modelling them in the beginning. It just seemed like the best option with my materials and shape. I started by outlining the end point of the slope and taking wood away to it with a microplane and rasp. A file cleaned up the roughness, and sand paper handled the final smoothing. I checked the feel in playing position, and made some adjustments. A control cavity is routed out to house all of the electronics. The hole for the input jack is drilled with a forstner bit in from the side to meet the control cavity. I decided to inset the oval jack plate for a cleaner look. Finally, a recess for the control cavity cover is routed. Now you know how many holes it takes to fill the, um, guitar. This entry was posted on July 28, 2010 at 5:45 pm and is filed under Acorn House. You can follow any responses to this entry through the RSS 2.0 feed. You can leave a response, or trackback from your own site. 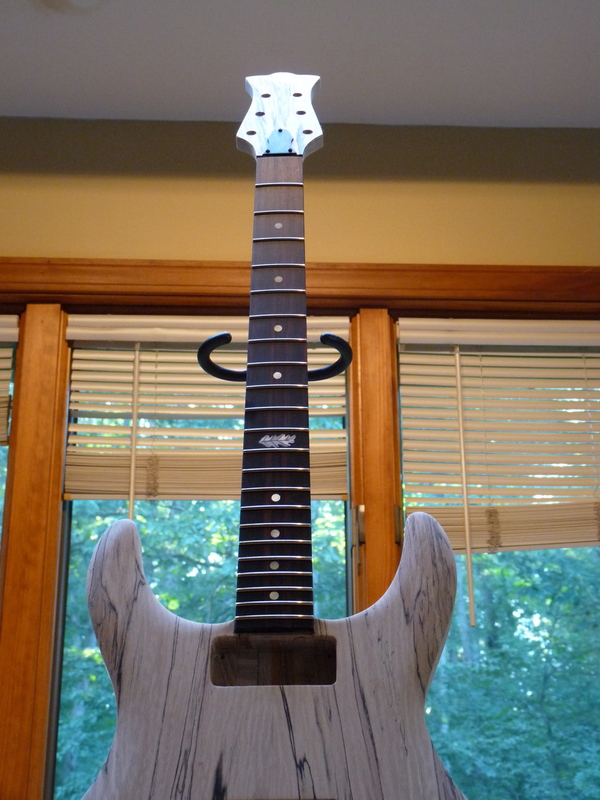 There are so many woodworking bloggers that are either currently working on or have just finished building a guitar that it has really stoked a fire in me to want to build my own. However – your posts have me convinced I have to wait for the perfect slab of figured wood. This slab of sycamore is positively stunning! Thanks. You’d be surprised where you can find those gems. This piece of sycamore came from a semi-pro miller in a batch of $.75bf half air dried boards he was trying to clear out. Don’t be afraid of starting. Since the top is only 3/8″ thick ( at most), it doesn’t take much wood. Look around, you may already have a small figured board that, when bookmatched, will turn into a stunner. Then, some maple or mahohany (or even walnut or wenge) for the neck and any thick, stable resonant wood for the body and you’re in business. Hiscock’s book is probably the best to start with. Pick up a copy and start planning! Wait till you see it with the finish on it, btw. Oil/varnish and spalted sycamore = magic!